MUNICIPALITY OF LILOAN, Cebu – The 1-CEBU Party on Friday has pledged a landslide victory for the senatorial candidates being supported by the Duterte administration in the province of Cebu. During Hugpong ng Pagbabago’s (HNP) campaign caravan in Liloan, Cebu, former Cebu Governor and incumbent Rep. Gwendolyn Garcia said 1-CEBU has committed to support the senatorial candidates endorsed by the political entity of Davao City Mayor Sara Duterte Carpio. “I speak for the province of Cebu which has seven congressional districts, 44 towns, seven cities… with this alliance between 1-CEBU and HNP, we commit to deliver and show our support to the chosen senatorial candidates of HNP precisely because 1-CEBU has always supported President Rodrigo Roa Duterte,” he said. The province of Cebu delivered close to 1.6-million votes to then Davao City Mayor Duterte during the 2016 presidential elections. Garcia, chairman of 1-CEBU, said the support shown by the party to Duterte would be replicated and extended to the Hugpong senatorial bets. Latest figures from the Commission on Elections showed that the province of Cebu has a total of 3,082,621 voters or around five percent of the 61,843,750 registered voters in the country. 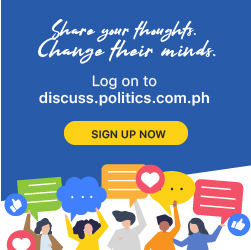 Garcia, who is eyeing a comeback in the provincial capitol, explained that she was not worried if HNP has more than 12 bets in its slate and has a different set of lineup from the ruling Partido Demokratiko Pilipino – Lakas ng Bayan (PDP Laban) party, for as along as no one from the senatorial candidates of the Otso Diretso senatorial slate would win in the province. “As long as walang papasok sa kabila, yun lang. Let them all (HNP bets) find it out kasi alam natin 13 ‘yan. Basta sa akin lang, for as long as walang papasok sa kabila,” said Garcia, also a member of PDP-Laban party.